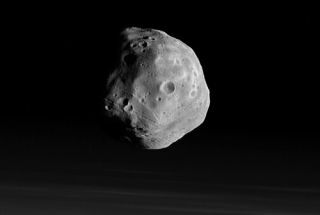 An image of Phobos by the High-Resolution Stereo Camera on board Mars Express in Jan. 2008. The larger and inner of the two martian moons is seen here floating just above the Martian limb. The image has been enhanced slightly to bring out the detail on the moon. A Europeanspacecraft is making its closest ever pass by the Martian moon Phobos today toscan never-before-seen regions of the small, rocky satellite. TheEuropean Space Agency?s (ESA) Mars Express spacecraft will skim just 60 miles(97 km) above the surfaceof Phobos, one of Mars? two diminutive moons, during today?s pass. The flybyis the third — and closest — in a series of five swings past Phobos this summerto study the moon in unprecedented detail. With adiameter of just 13.5 miles (22 km), Phobos is larger than Mars? second moonDeimos (7.4 miles, or 12 km, along its long axis). Both satellites were firstspotted by astronomer Asaph Hall in 1877, but researchers are still unsurewhether the moons are actually captured asteroids, ancient planetismals fromthe birth of the solar system, or the remains of a massiveMartian impact. MarsExpress made its first summer swing by Phobos on July 12 at a distance of about350 miles (563 km), with subsequent passes bringing the spacecraft within 60 miles(97 km) of the moon at the closest and out as far as 412 miles (664 km) on the final flybyset for Aug. 3. The probe has flown by Phobos before, such as its August 2004 passat a range of about 124 miles (200 km), but never as close as today?s visit,ESA officials said. Mars Expresshas turned its full complement of science instruments on Phobos for its flyby series, including a high-resolution camera formapping and three-dimensional images, a subsurface-probing radar to study the moon?sinterior and other tools to take detailed measurements of Phobos? mass,composition and other features. Missionmanagers said Mars Express may also catch a glimpse of the planned destination for Russia?sPhobos-Grunt lander, a spacecraft slated to launch in 2009 to collect samplesof the small Martian moon. MarsExpress is not the only spacecraft to take a look at Phobos thisyear. In April,NASA?s Mars Reconnaissance Orbiter turned its camera eyes on the pitted moonfrom a distance of about 3,600 miles (5,800 miles) and returned some of the mostdetailed views of Phobos to date with its High-Resolution Imaging ScienceExperiment (HiRISE) camera.